Patch 2.0.5.12 has been released! Taking this opportunity - we would like to wish you all the best in the new 2017 year! By the way - if you don't own Original War yet - you can buy it on the Winter Sale 2016 on Steam for 0,89€! Improved: Workshop Synchronisation will now occur when you open the Mod Launcher (Also added more info to it). I want to inform everyone that since few days ago Original-war.net and forum apart from being in Polish, Czech, English, French and Russian, is translated completely in Spanish. With our website in Spanish, people who speak this language can find things what they want easier and hopefully, some people will join our community of OW and we will be more than before! I will translate other things! GGChyba is hosting dedicated servers for you. They should be available for about 10h per day. You may choose between different maps and rules. Also, this action may be supported by other players. So, enter the multiplayer lobby and play! Feel free to join our Teamspeak 3 24/7 server: original-war.net! 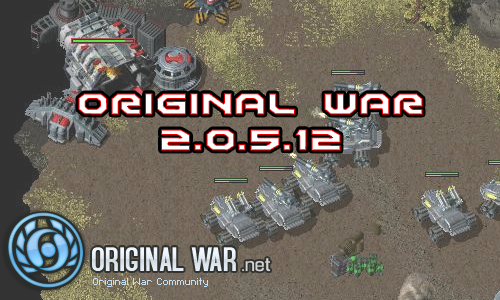 Original War 2.0.3.5 has been released. Bug Fix: Am06 - Fixed minor misspelling. Note: Steam Workshop support requires Bohemia to enable it on their end (Currently only people in the OwarWSGroup can use the workshop). As of today the Original-war.net website and forum is going to be served in English, Polish, Czech, French, Russian and SPANISH. Although the only parts of the website that are currently translated are the interface, we will be working on bringing you as many articles of OW.net as possible in Spanish in addition to their English and Polish versions. As you may know, OWN staff is working on improving our services for a multi-language community. After today's update you may hide regional sections, so - as we hope - using of forum.original-war.net would be more comfortable for you. Happy posting.